Disclaimer: Any mod presented in this thread may or may not violate your warranty contract with your manufacturer. Proceed with caution! socketted CPU allows a easy user upgrade i7-quad, with multi unlock capability for i7-37x0QM, i7-38x0QM and i7-39x0XM CPU OC. can use up to 2133MHz PnP memory modules and/or enable XMP Profiles for up to ~158% better RAM performance compared to the stock single channel 1x4GB option when paired with a i5/i7 CPU. 14" with dual-LVDs 900p option. switchable Graphics NVS5200M dGPU option with Optimus, similar performance to a GT720M/GT620M and faster than the HD4000 iGPU. expressCard Slot (4Gbps) allows to connect expansion cards or even eGPU for gaming, video editing CUDA/OpenCL processing or driving more external LCDs. ODD can be swapped with a second 2.5" 9.5mm SATA-III 6Gbps SSD or HDD in a caddy & in a JBOD, RAID-0 (performance) or RAID-1 (redundancy) configuration. internal WWAN/3G capable : non-whitelisted install a WWAN/3G, a mobile SIM and surf the internet anywhere. battery options include a 65Wh 6-cell, 97Wh 9-cell battery, 3-cell 30Wh E-module Battery (replaces the ODD) and 97Whr 9-cell clip-on slice via the docking connector with a total according to Dell 32.7h! It can recover 80 percent of its charge in an hour of charging. eGPU @ x2 2.0 (8Gbps) capable compining two of the mPCIe ports. dynamic TOLUD to easy accomodate eGPU and/or ability to manually set TOLUD (from 1GB to 3.25GB) using UEFI variables freeing up PCI space to host more than one eGPU units. Set specific multiplier values (for +400MHz i7-37x0/38x0 or up to the cooler ability Extreme CPU i7-39x0 OC). Guide here by Tech Inferno Fan-Khenglish. On some occasions this will only work with an unapproved power brick. Otherwise you will be TDP limited. When using an approved power brick, CPU TDP on an xm cpu would be limited to the long power limit of 55W at all times. When using an unapproved power brick, The short term power limit would then work, allowing up to 68W, and full x4 turbo multiplier. Raising the power limits using IFR only worked when using an unapproved power brick. Using an approved brick would always clamp power draw to 55W. Lower TOLUD value to allow dGPU and eGPU or multiple eGPU solutions without need for compaction. Set your EC port to gen1 to use with older hardware that would work with x1.1 signals only here. I found this manual that gives explanation, what most of the UEFI variables do. * Use PnP memories with JEDEC timings @ 2133MHz to OC RAM. here. Performance results here. * Cooling mods in order to avoid thermally introduced throttling when OCing (Dewos & and timohour). * Overclock dGPU core and memory for up to 35% better performance than stock here. * Unlocking flash descriptor and setting a x2 2.0 [8Gbps] for eGPU here. * Reveal hidden BIOS settings! (thanks @xsmile) Settings in this menu display all possible options in a human readable form and you don't have to deal with hexadecimal numbers. According to E6430 schematic PCI-E port 4 is wired to the E3 Module Bay. On schematic page 29 E3 Module is supposed to wire to JSATA2 which happens to be the ODD connector. 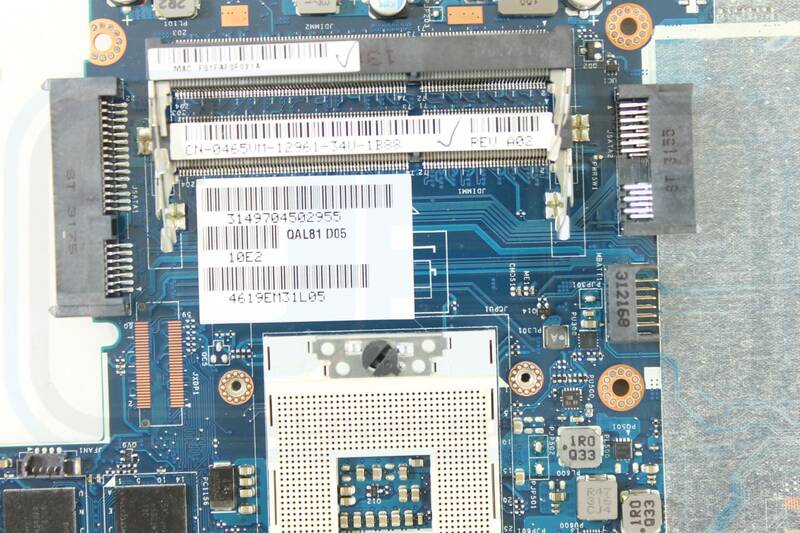 There is a close up of E6430 motherboard near the ODD connector where we can see that JSATA2 connector is a standard connector. From what I get, E-module Bay II is supposed to carry USB 3.0 ports based on an PCI-E chip. Is it possible that this will be used for both SATA signal and/or PCI-E signal? EDIT: JSATA2 is a double sided connector with SATA and power on the one side and pcie signal on the other. It seems that a mini pcie PM3N connector physically fits. It should be investigated further if it works. UPDATE: To avoid any misunderstanding x4 2.0 is still a work under progress. There is no proof, yet, that it works! If this is not only on papers, this mean that Dell E6430 is capable of a "clean" solution @ x2 2.0 (8Gbps) using the Expresscard (port 3) and a custom DIY connector from ODD caddy (or sata) to HDMI to connect to PE4C, all this without opening your laptop. And maybe an x4 2.0 (16Gbps) connection using WWAN (port 1) WLAN (port2) EC (port3) and E3 Module (port4) with a custom made connector. Offcourse all this could happen if there is a way to enable flashing the machines Descriptor Region with fitc/fpt. ports 5,6,7,8 won't show in Setup 1.30 and if you try to enable them it hangs. WWAN is USB/mSATA. The results of Descriptor Region manipulation with fitc and successful flash with fpt is port 1 @ x2 2.0 and port 3 @ x2 2.0 both useless. Maybe it could be helpful a thread in the eGPU section with the port layout of eGPU users' laptop? I could handle the table. 1080P or higher resolution : not possible since the E6440 uses a LVDS rather than eDP internal LCD interface. The max resolution available in 14" LVDS is usually 1600x900, representing 37% more viewing area than 1366x768. <strike>Though ebay has 14" 1680x945 LVDS LCDs, giving an additional 10% more viewing area over 1600x900 or 51% over 1366x768.</strike> --> 1680x945 LCD does not fit correctly as attempted here. Just a note. 1ch LVDs support a display resolution of up to 1400 × 1050 @ 60 Hz refresh while a 2ch link can boost the maximum display resolution up to 2048 × 1536 (QXGA) @ 60 Hz. (wiki) That's how we could install a 1080p screen on a HP Probook 4530s with 2ch LVDS cable. Unfortunately we do not have any 14" 1080p 40-pin LCDs. We know that there were some in existence - but we have never had our hands on it. (We have several 30-pin eDP 14" LCDs @ 1080p - those are the newest stock). The real problem is that most of the 14" LVDS 768p/900p screens that exist aren't good (no IPS options either). The only notable screen (that I am aware of) in the 14" TN panel category is the Thinkpad X1 Carbon (gen 1) screen and its price is too high. UPDATE: Seems like there was a mistake in the panellook.com site. This screen seems to be an 768p. I even confirmed with a seller who had the exact same part Number. You are right. But it is not available apart from a few chinese sellers. Most trustworthy sellers sell a combatible 768p screen. link . .
Of course one would like to see some more details of the item from the seller before purchase. I don't think he will actually sell a 1080p screen. Any way I think that 900p for 14" is more that enough and I am being a bit greedy... . I was actually referring to yoybuy and aliexpress (eBay if possible), I been done a lot of shopping there of the more rare kind. Do you know which values i should modify to disable the dGPU? I tried today to disable dGPU on my recently purchased Dell E6430 (NVS5200M UEFI win 8.1 64) using this experimental method cause when I tried to disable dGPU with Setup 1.x (legacy W7 64 installation) my computer would inexplicably freeze upon boot. The result was to completely lose my internal screen functionality upon next cold boot (I didn't have my eGPU connected atm). After disabling the PEG (using command setup_var 0x187 0x2) my internal screen wouldn't light. I tried to use amy flash light to see if it was only the backlight that was off but I realised that it was completely off. Windows 8.1 booted normally ( I could here the sound of Skype loading) but I couldn't use neither the internal screen or any other external output (VGA, HDMI). 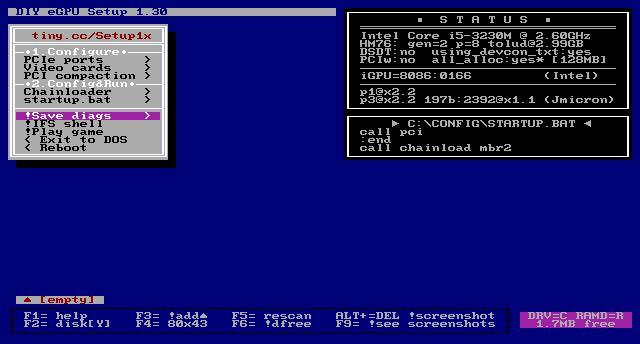 I finally managed to revert the setting blindly (F12 and testing each boot device until I booted my UEFI USB flash drive and type setup_var 0x187 0x0). I wouldn't recommend this method to disable the dGPU at least on a Dell E6430 as it could probably brick the machine. Note: If anyone else wants to try this, have in mind that the default BIOS setting on a E6430 for boot is legacy mode and if you try to remove your CMOS battery to revert BIOS default it could completely brick your device. Thank you the heads up. I've placed a warning against this action in the original post at http://forum.techinferno.com/dell-latitude-vostro-precision/6980-14-dell-latitude-e6440-owners-lounge-4.html#post111145 linking to your experience. As an aside, the Dell E6430 should be x2 2.0 capable. I was eyeing those systems to do such an eGPU implementation given the noteworthy performance improvements, eg: http://forum.techinferno.com/implementation-guides/3062-2012-13-macbook-pro-gtx660ti-hd7870%408gbps-tb1-th05-win7-%5BTech Inferno Fan%5D.html#post42483 but never got around to it. You'd need a PE4C V2.1 x2 capable eGPU adapter to do it with. Involved would taking a dump of the BIOS, eg procedure to do that is here, modifying he ME FW with the Intel FITC utility to change the PCIe port straps for port1 to be x2 rather than x1, then flashing it back. It was a bargain @ 200$ since it came with 900p, WWAN 4G, Intel 6205. I just have mixed feelings cause it is the dGPU model... I was hoping I could completely disable it using this trick but... impossible. Great buy there. I quite like the HD+ 14" E6430 as well as 14" HP 8470P/8460P. The E6430 being the better eGPU candidate because of it's x2 2.0 potential. Unfortunately the only way I found to unlock the flash descriptor with my E6440 was to jumper the ALC chip as demonstrated at http://forum.techinferno.com/dell-latitude-vostro-precision/6980-14-dell-latitude-e6440-owners-lounge.html#post99289 . Good news is that if you do it once, you can disable the ME read only mode in the bios itself so only need to jumper it once, mod the bios, flash it and have the ME unlocked thereafter to be able to mod the MW for BCLK overclocking as well as x2/x4 PCIe port straps. I'm glad the E6430 found it's way into your hands. We may have an exclusive from you - the FIRST ever publicly documented x2 2.0 eGPU implementation using multiple mPCIe ports on a SB or newer system May see upward movement of E6430 s/h values as a result. It was very easy to set port 1 & 3 of my hp 6470b @ x2 2.0 but it was useless. I also tried to enable a reverse x4 2.0 but the card reader in port 3 would get it the way. Did you mod and then flash the ME to get x2 2.0 on the 6470B? E6440 was quite easy to get access to the audio chip. Just remove the keyboard and palmrest. I described the precedure here. 14" E6430 and HP 8470P/6470B offer a 1600x900 LCD option and the larger chassis dissipates heat better if looking at a quad-core upgrade. Dell E6430 pips the HP 8470P/6470B due to x2 2.0 eGPU possibility (no done yet, but @timohour looks to be onto it) as well as UEFI variable modification to probably allow unlocked turbo multipliers to function (i7-3720QM or better). With the proper gear it will be up and running soon. I just have some hard time unlocking my ME firmware but I am probably going to ask for help from @Khenglish over at Lets enable overclocking on all 6 and 7 series laptops or it may be my 3120M (will be replace it when I have the time). I wouldn't recommend the dGPU model though. It gives me a hard time trying to connect my eGPU. Hello everyone! I've recently acquired an E6430 (HD+, NVS5200) and found it to be a suitable upgrade for my 2570p. Currently waiting on the caddy, but I'm glad to know that x2.2 looks to be up and running. @timohour, I'd very much like to see your step-by-step guide on how to unlock the Flash Descriptor. Looking forward to working with you guys soon. As stated on the first post by Tech Inferno Fan Dell Latitude E6430 is one of the Ivy Bridge laptop which ports are on the right order to be able to create an x2 2.0 link. He also said that on SandyBridge and IvyBridge laptops we can not enable x2 2.0 link with Setup 1.x software but only with mod in the BIOS and particularly the Flash Descriptor. Thanks to Khenglish, Tech Inferno Fan and others on the Lets enable overclocking on all 6 and 7 series laptops thread I realized that we can use FITC to program our Flash Descriptor to create an x2 2.0 link out of two continuous ports (port 1 + port 2, port 3 +port4 etc.). HPs and Clevos currently have a fairly easy way to unlock your Flash Descriptor (as it is discussed on Lets enable overclocking on all 6 and 7 series laptops) but I found out that most of the HP Probooks and Elitebooks (tested 4530s/ 4340s / 6470b /8470p) don’t use port 1 and they use port 3 for SD card reader. That’s why I switched to Dell E6430. I carefully read post #6 by Tech Inferno Fan and Inspiron 15 schematic and realized that in order to temporarily unlock my Flash Descriptor I had to apply a High Signal (3.3V) on the SD OUT. As you can see in the schematics E6430 uses 92HD90B2X5 chip where the SD OUT pin is on pin 5. In the spoiler you can see exactly where the 92HD90B2X5 chip is located on a dGPU model. In order to reach this point you have to remove HDD (2 screws), ODD, bottom cover (3 screws), keyboard bezel, keyboard (4 screws top, 2 screws bottom), WWAN (if available 1 screw) and palm rest (2 screws top and 10 bottom). Thanks to @sskillz we know that on the iGPU model IDT chip is on the bottom side of the motherboard. Once you locate the chip the procedure is the same both on iGPU and dGPU On chip 92HD90B2X5 you can find a High Signal on pin 9 or even better the resistor that leads there (not pin 1 as on E6440). All you have to do is paperclip pin 5 and pin 9 just on boot. then save the file. this will unlock the descriptor. Flash it back and you are a free man. Now you can use FITC and set your port 1 (WWAN) to x2 2.0 mode. For x2 2.0 to work you have to use 2 mini pci-e ports: port 1 (WWAN) and port 2 (WLAN). You can use mini pci-e port 5 (under the WWAN) to connect your wifi card (tested it and working) because after turning port 1 to x2 2.0 port 2 will be disabled. I have come this far but haven’t connected a GPU @ x2 2.0 yet. Hope I have the necessary parts soon and try it. Thanks to everyone who contributed so far. Feel free to correct or contribute. @timohour, thank you for the guide. Your instructions are very helpful and understandable. Struggled a bit with the picture but soon realized that that bump looked like the resistor you were referring to. When booting after bridging, will you have access to the laptop keyboard? Or do you need an external keyboard? @timohour, great stuff with the new thread. I've moved across much of the E6430 stuff from the E6440 thread as well and used one of your older posts in the Series-6 overclocking thread as a place marker for the opening post, ensuring it's quoted and remains in context in the orignal thread. That way don't need to start shuffling content around to make room for the opening post. I'll add that I refer to x1 2.0 as 4Gbps, x2 2.0 as 8Gbps. That's what the transfer rate is after 8b/10b encoding is applied. 10Gbps-Thunderbolt is attached using a x4 2.0 electrical link with the downstream 10Gbps being the limiting factor. I recorded 10Gbps-TB1 have at least 12.5% more throughput than x2 2.0. Thanks for the mods! (maybe posts 4-7 are useless and out of place?) I was thinking preserving some posts on the 1st page to include all mods there but I will create links in the first post. Corrected it on my 1st post, feel free to correct such mistakes. Now, lets get to the good staff! Till now we just speculated that x2 2.0 would work with an eGPU. How about some actual proof? I was pretty impatient if this was going to work or not and that's why I pulled together some of the stuff that I had lying around and soldered some wires from a mini pci-e to sata adapter to an x16 riser. I was pretty amazed to discover that it works!!! I am happy that it worked that way (even for a little). It seems like my quest wasn't just a ghost huntιng. You may noticed that my TOLUD is 2GB. I used UEFI variables to set it that low. I will describe that also. You may noticed that my TOLUD is 2GB. I used UEFI variables to set it that low. I would describe that also. Are using the same MAX TOLUD UEFI variable to lower TOLUD on your E6430 as I listed for the E6440 http://forum.techinferno.com/dell-latitude-vostro-precision/6980-14-dell-latitude-e6440-owners-lounge-4.html#post111145 ? You can try setting your port1 to Gen1 speed using the PCIe Ports->Gen1 menu in Setup 1.30. The lower speed might make you cobbed together eGPU adapter work reliably at x2 1.0. Enough to do a benchmark run and be enough to document how to do it all as a proof of concept until you get a Gen2-capable PE4C V2.1. I'll mention some vague info I had about PE4C V1.2 sent to me. PE4C V1.2 (PCIe x16 Adapter) . A user suggested it had two x1 connectors on it on it's underside. Never had proof of that, nor do any BPlus photos show it's connectors, nor are the schematics accessible. Was he correct? PE4C V1.2 is rather inexpensive and uses flat FFC cable which may be more convenient in your dual mPCIe cabling configuration. Agreed, a x2 2.0 eGPU 8Gbps) teams up very nicely with a Dell E6430/E6530 making it a very cost effective, high performance solution. Certainly better than a 4Gbps expresscard one. The notebook itself is outstanding with it's build, i7-quad upgradability and HD+ screen. 16Gbps-TB2 is of course better but someone is marketting TB2 for the upper end of the market. TB2 being only in Macbook Pros and business workstation machines, both of are premium cost machines. I decided to use UEFI Win 8.1 installation (getting ready for Win 10) and that's why I cannot use setup 1.30 on this drive. I booted from an eSATA drive where I have Setup 1.30 installed and that's how I got my screenshot. I maybe try to find the UEFI variable to change it from Gen 2 to gen 1. That's great info. I can connect my 280x and see if it works better. I was afraid to use it at the begining but it should work now. Or maybe try an older pcie card. Agreed, a x2 2.0 eGPU 8Gbps) teams up very nicely with a Dell E6430/E6530 making it a very cost effective, high performance solution. Certainly better than a 4Gbps expresscard one. I know that but as you pointed out it is not the one cable TB solution. You know that my quest was to try use the E-module II port 4 and create an x4 2.0 link (just for testing) and conclude with an x2 2.0 external link using EC port3 and E-module II port 4. Having to take apart my laptop every time I want to connect the eGPU is not an acceptable solution for me. If I don't find a way around it I am maybe going to settle for an unupgradeable Macbook Pro too. But where is the fun in that? Invariably looks like eGPU users wanting performance will migrate over to Macbooks. The latest Macbook Air with a TB2 port. No TB2 chip in a PC notebook unless you spend big on a workstation. You'd think one ultrabook manufacturer would put a TB2 chip in it? The port3+4 solution would be the way I would have done it too. There you could keep it one cable (EC) for rudimentary eGPU stuff and plug in the other cable when wanting high performance gaming. Am curious to see how you'll cable it all. Invariably looks like eGPU users wanting performance will migrate over to Macbooks. The latest Macbook Air with a TB2 port. No TB2 chip in a PC notebook unless you spent up big on a workstation. You'd think one manufacturer would put a TB2 chip in an ultrabook? That makes two of us... I had some plans but my latest failure sets me back. Since this is the main computer I use at work I bought a Dell PR02X Docking station along with 130W adapter to connect my peripherals. I chose a USB 2.0 PR02X because it comes with a variety of ports including a serial port and 2 displayports and it is fairly cheap. EDIT: Confirmed HDMI is connected on NVS5200M and the E6430 can probably handle 4 external screens. Using 2DP and 1 VGA on docking station plus 1 HDMI connector on laptop. NVS5200M can only handle up to 2 screens. I don't know if this will work with the iGPU model. It is highly possible that you can connect two DP external screens, since HD4000 can drive 3 screens simultaneously as long as two of them are connected with DP. Schematics sho that the wiring of the docking connector for the iGPU model wires both displayports slots to iGPU Displayport C and D. It will most probably work with 2 DP screens or 2 active DP to VGA adapters. If you are interested for more screens you can use a low cost eGPU running through the EC slot.